The Los Angeles Chapter of the Cystic Fibrosis Foundation announced today the launch of the nationally branded fundraising campaign, the CF Cycle for Life. 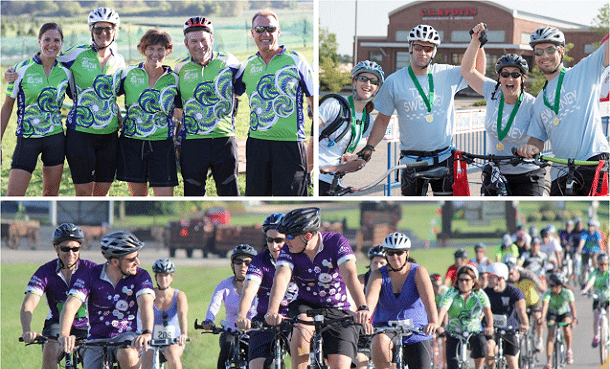 With more than forty rides across the country, thousands of participants will take part in these premiere cycling events, which generate critical funds to fight cystic fibrosis, an inherited fatal disease. Funds raised through the CF Cycle for Life have helped spur dramatic progress in the lives of those who have cystic fibrosis. Fifty years ago, most children with CF did not live long enough to attend elementary school. Today, people with CF are living into their 30s, 40s and beyond. Currently over 50% of our CF patient population is over the age of 18 because of the specialized treatment the CF Foundation has been able to provide. An estimated 30,000 adults and children in the United States and 70,000 people worldwide have cystic fibrosis. It causes debilitating lung infections that lead to premature death. More than 10 million Americans are symptomless carriers of a defective CF gene. CF Cycle for Life, the CF Foundation’s premiere cycling event, unites families, corporations, CF care centers, student groups and other dedicated friends with the common goal of finding a cure for cystic fibrosis. The CF Foundation is an accredited charity of the Better Business Bureau’s Wise Giving Alliance. To help fight CF, get involved in CF Cycle for Life by calling the Los Angeles Chapter at 323.939.0758 or by visiting www.fightcf.cff.org/LAcycle or emailing [email protected]. About the Cystic Fibrosis Foundation The Cystic Fibrosis Foundation is the world’s leader in the search for a cure for cystic fibrosis. The Foundation funds more CF research than any other organization, and nearly every CF drug available today was made possible because of Foundation support. Based in Bethesda, Md., the Foundation also supports and accredits a national care center network that has been recognized by the National Institutes of Health as a model of care for a chronic disease. For more information, go to www.cff.org.